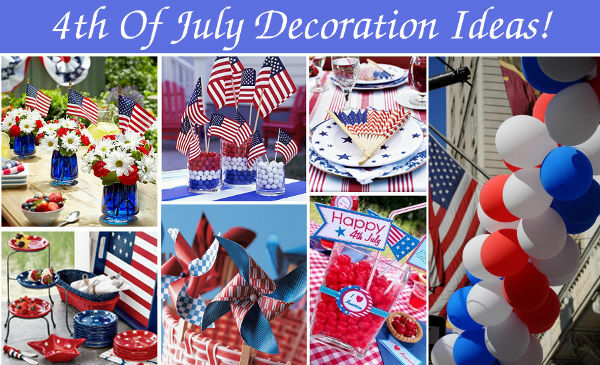 Free Online Coupons: 4th Of July Decoration Ideas For Home! 4th Of July Decoration Ideas For Home! 4th of July - an amazing federal holiday, carries something for everyone. It's time of the year to celebrate with July 4th fireworks & parades, stellar picnics with friends & family, fresh aroma of barbeque, big gifts, and of-course lots of outdoor fun. On this widely publicized occasion show off your true colors and celebrate Independence Day with great enthusiasm & patriotic fervor. Floral Arrangements: Make your celebration festive with beautiful fresh flower decorations in white, red and blue. Creatively arranged blooms like roses, carnations, lilies, daises, tulips, and more will add elegance and style to any space. Table Setting Decors: Table decoration forms central part of any celebration. Adorning tables with Stars and Stripes table cloths or other sheets depicting American symbols is a great idea. Add flair to it with patriotic table runner, eye-catching napkin rings and tableware.